A damsel fly (I think) taken yesterday when a number of them decided to hang out on a garage door. 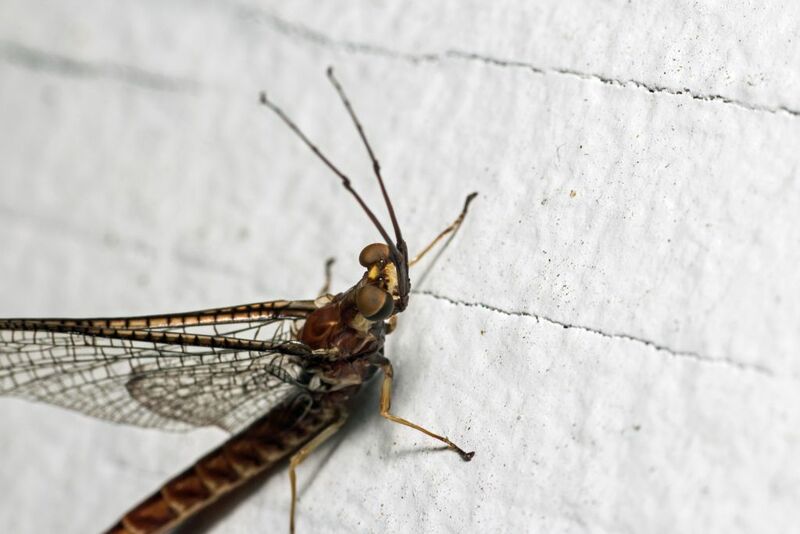 According to someone in another forum, it appears to be a baetis or type of may fly. Yes. looks like a mayfly to me too. I was really surprised at how well that came out. Apparently those upward facing eyes are an artifact of dimorphism, allowing the males to see the females, from below. Transparent wings held together above the back, second pair of wings much smaller. Very big eyes, "turban eyes" indicating a male ready to spot the females. First pair of legs lifted to antenna like position. Don't know the american species. I've never really payed any attention to them before I started doing macrophotography. These are the first pictures I've ever taken of them (and the previous robber fly). I just wish there were more subjects around here. There are spiderwebs everywhere, full of prey, but no visible spiders. One of the great effects of doing macrophotography is you train your observing skills. You will soon realize that when you look closer there is almost always something to discover. It cooled off significantly yesterday. I went out yesterday evening, and the ONLY thing I saw was a large ant (too fast to photograph well) and a lone may fly. I may take a break from fielding calls about jobs this afternoon to look around the parking lot.